Today was a long day but not too had until the very end. I left camp at around 7:30am and hit the road for a good 7km towards Mangamuka. Walking on State Highway 1 wasn’t too bad. There is not a lot of verge to play with and you have to keep crossing the road to ensure there won’t be any blind corners for cars or trucks to clean you up. For the most all the traffic left plenty of space for safe walking. There was the odd car that must have thought it was a sport to see how close they could get to the tramper. I got to Mangamuka Dairy at around 8:30am and ordered a bacon & egg toasty plus a coffee milk. Lisa was a very friendly and welcoming host. There is not much in Mangamuka and the Te Araroa trail is now bringing travellers from across the globe and their trade who Lisa really appreciated and welcomes in. While I was waiting for my breakfast to be cooked up, Bob, the older kiwi I met at Utea Camp on 90 mile beach came into the store and shortly after that Chris and Cathi from Germany who I met in Ahipara also arrived. They all camped the night in the back yard of the cafe owner. Catching up with everyone it occurs to me from their comments I walk very quickly and very far. Am i going too hard at this? I don’t think so. I think I’m setting a fairly good pace. If I only walked a couple of hours each day or only 15km a day it would take me more than 6 months to get to Bluff. It also occurs to me that most people are walking the Reatea Forest and Puketi Forest over 2 days each. All in all, thats a lot of days and a lot of food to carry from Apihara. Bob, Chris and Cathi have all had an extra travel day on me (given I sat the rain out Monday) and I’ve caught them. Anyway, I eat my breakfast and have a catch up with Bob, while Chris and Cathi hit the road. Today was mostly all road bashing to get to the Mangapukahukaahu Stream – have you got that – Manga puka huka a hu – 24km in total to get to the stream. Then a 2.5km walk down through the stream it self to the junction with the Mangapa River and along some bush track to the Pukatea Ridge. Road walking was fast but bloody boring to do. There were quite a log trucks and it’s a bit dodgy to listen to the ipod to liven things up. 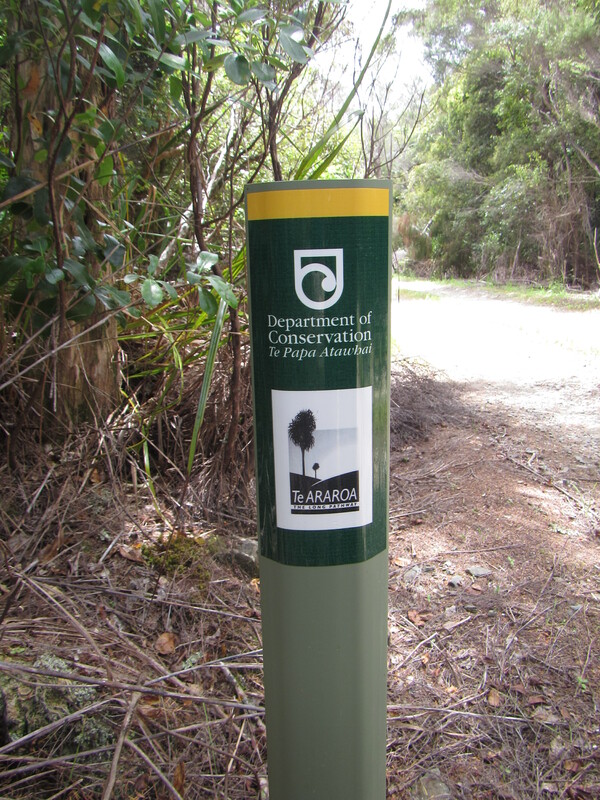 Just after 12pm I had caught Chris and Cathi at the junction of the Kauri Sanctuary Road and had lunch with them. Their destination for the day was Apple Dam Camp only another 1km on. They took off as I repaired my blistered foot and Bob also arrived. He was also staying at the camp site. I pressed on and reached the stream by 2pm. Walking through it was refreshing. Cool on the feet and cleansing for my trail runners. The creek flowed through a steep gorge, sheer on both sides, lined my palms, ferns and tall trees. The walk consisted of wading from shoal to shoal and occasional across rock bars. Dangerous to do after heavy rain, there is a wet weather bypass option but today was fine. Bright sun over head and no rain in sight. There were the odd deeper pools to wade through, just under undie height, but nothing to be worried about. I found one really deep hole and jumped in for a cool down but that only lasted a minute or so, too bloody cold. I finally got to the river junction. Looking at it it is deep! Very deep. The tannin stained water blacks out the bottom but you can tell it is over head height. I can spy the trail marker directly on the opposite bank and initially think it will be a pack swim but that’s just too dangerous. Looking at each bank on my side it is steep and the river level plunges straight down. There isn’t any footing to scrambling around the sides to a better crossing. It was only on closer inspection of the last trail marker on my side of the river and triple checking the trail notes I find a very steep trail leading up hill to the south. I follow this and it soon comes to a much better crossing. All is good and I’m across. The rest of the day was following the trail along the river until I found a nice camp spot and couldn’t walk any more. Most of the track is sidle and is very difficult on the feet. Timed it just right. Set up, fed and in bed, it started to bucket down rain. What an amazing journey to follow from the other side of the globe!